Brake service needs to be top quality or taken somewhere else. Brakes and the braking system are too important not to be done thoroughly and with the highest quality products. As a locally-owned company offering brakes and brake services to the Battle Ground area since 1980, we are invested in our community. We also live and work in the area and we want everyone to be safe on our roads. If you are hearing that familiar squeal when you break, come by and let us inspect your brakes. We handle the latest technology anti-brakes systems as well as those on older cars. Come to us whether you have a disc for drum braking system, we have the expertise in all types. Whether you just need your brake pads replaced, or need additional repairs, our experienced mechanics will find the issue and repair it. We offer comprehensive brake services including testing for leaks, replacing fluid, pad replacement, rotor reconditioning, wheel bearing replacement, cylinder repair, caliper repair and replacement, shoe replacement, adjustments, anti-lock system repair and replacement, and more. Contact us for fast, convenient brake service! If you notice any of these warning signs or it has been a while since you have had a brake inspection, come by the shop or call to schedule a service. You and your safety are paramount to us! 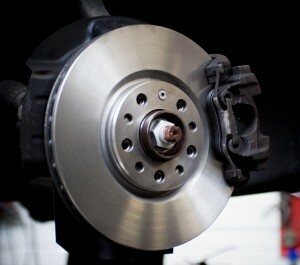 If you are hearing that familiar squeal when you brake, come by and let us inspect your pads and rotors.